Peeling back the grass has revealed a high population of white grubs. Grubs are the most serious and destructive lawn insect pest in Illinois. While not all lawns will get grubs and the extent of grub damage varies from year to year, there are some important points to consider concerning managing grubs in lawns. Grubs are typically white in color, with a characteristic "C" shape body when found in the soil feeding on lawn roots. Grubs are the larval stage of beetles. The most common grub species in our area is the larval stage of the Japanese Beetle. Eggs are laid in the soil in mid-summer, primarily on well-watered lawns in full sun, often near pavement. 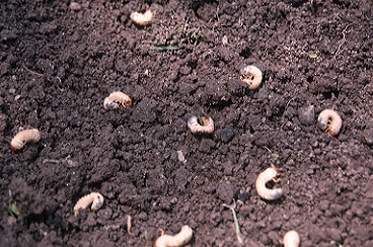 Damage from grubs typically starts in mid August and may continue until early October. Other species may damage lawns in northern Illinois, but usually are not as common as the Japanese Beetle. Monitoring and control of these species is the same. The true white grub (May or June beetle), for example, typically has a 3-year life cycle, meaning it could potentially damage lawns throughout the season. Adult Japanese beetles are serious defoliators of many ornamental plants. Racoons looking for grubs have significantly damaged this lawn. 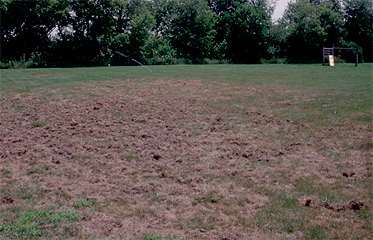 Since grubs feed on the roots of lawn grasses, damage will appear as browning of the lawn. Consider that this also could be due to problems such as drought, poor soil, and diseases. However, grubs are easy to find by lifting sod in damaged areas and checking the root zone for the whitish grubs. Don't treat for grubs that don't exist! Skunks and raccoons may tear up lawns in search of grubs, even when grub numbers are relatively low. Typically a population of about 12 grubs per square foot can cause lawn damage that requires control; whereas lower populations may not damage the grass, they may attract skunks and raccoons. Lawns showing damage from grubs may be treated with an insecticide. Insecticides available for homeowners include Imidacloprid (various trade names), chlorantranilprole (GrubEX), triclorfon (various trade names) for control of white grubs. Heterorhabditis bacteriophora nematode is an example of an alternative product for white grub control that is available. For all products, read and follow all label directions, then apply to damaged areas. Water the insecticide into the soil immediately. If treating a large area, stop after a portion has been treated and water the material in, then complete the rest of the lawn area needing treatment. Only treat in and around affected areas; grubs may only be in a small part of the lawn. Imidacloprid is suggested to be applied before grub damage appears. An example of a way to use this product would be to apply in July to irrigated lawns that are surrounded by dry lawns, especially when adult beetle flight is high in areas with a history of grub damage. Spring treatment for annual white grub is not suggested since the grubs feed for a short period of time in spring and are reaching maturity, thus are not controlled easily. In addition, turfgrasses are actively growing at that time so usually dont show damage.